I recently had the chance to watch Cría Cuervos (‘Raise Ravens’), a 1976 drama film by Spanish director Carlos Saura. The film, which won the Special Jury Prize Award at the 1976 Cannes Film Festival, was shot as Spanish dictator Francisco Franco was lying on his deathbed. While it deals with themes like childhood and loss, one can also find subtle allusions to the contemporary political situation and the changes Spanish society was undergoing at the time. Cría Cuervos left quite a strong impression on me. As the story unfolds Saura manages to create a miniature, fragile universe of emotional intensity and introspective -almost claustrophobic- atmosphere (most of the film is shot inside a single house). In the center of this universe lies Ana, the little girl protagonist, played by 8-year-old Ana Torrent whose performance is absolutely mesmerizing. Ana’s father (a general in the Spanish army), her mother and two sisters (together with the rest of the characters in the film) all seem to revolve around her, like planets in orbit that occasionally draw nearer or get farther away from little Ana. The film’s exemplary direction and great performances aside, I was also intrigued by its music. Jeanette’s pop song Porque te vas recurs throughout the movie, adding a bittersweet feeling to the film’s imagery. What is more, the film’s main music theme is Cançó No.6 in E-flat minor by Catalan composer Frederic Mompou (1893 – 1987), a wonderfully melancholic and haunting piano piece. Originally dedicated to Arthur Rubinstein, it was also a favorite of celebrated Italian pianist Arturo Benedetti Michelangeli. PS: The film’s title comes from the Spanish proverb Cría cuervos y te sacarán los ojos, which literally translates as: “Raise ravens, and they’ll take out your eyes”. 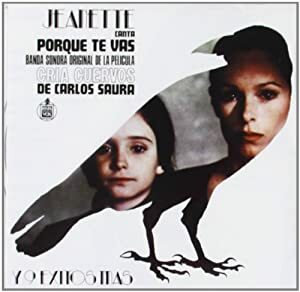 This entry was posted in Film & Music and tagged Cria Cuervos, Film, Jeanette, Michelangeli, Mompou, music, Rubinstein, Saura, soundtrack, Spain on September 27, 2013 by The Muser.